Possibly because I get my inspiration from texts of all different shapes and forms, I am a fairly non-traditional novelist. Not that I’m sure there is any traditional way to be a novelist: rather, I don’t ever start anything at the beginning. Perhaps nobody does, and that’s just some myth baby writers are fed, some mad unrealistic idea of what it takes to build an 80,000 word functioning story-machine. I most definitely don’t start at the end: I hate endings, of television shows and novels and video games and even often of movies, because I prefer the preserved state of a fictional world in my head than any sort of satisfaction that comes with finality [Preach!]. I tend to start developing a story from a single image - something that catches in my thoughts and insists itself into the world [Snap]. In Spare and Found Parts’ case - it was a mannequin hand floating in the water, a backdrop of a ruined Dublin city. 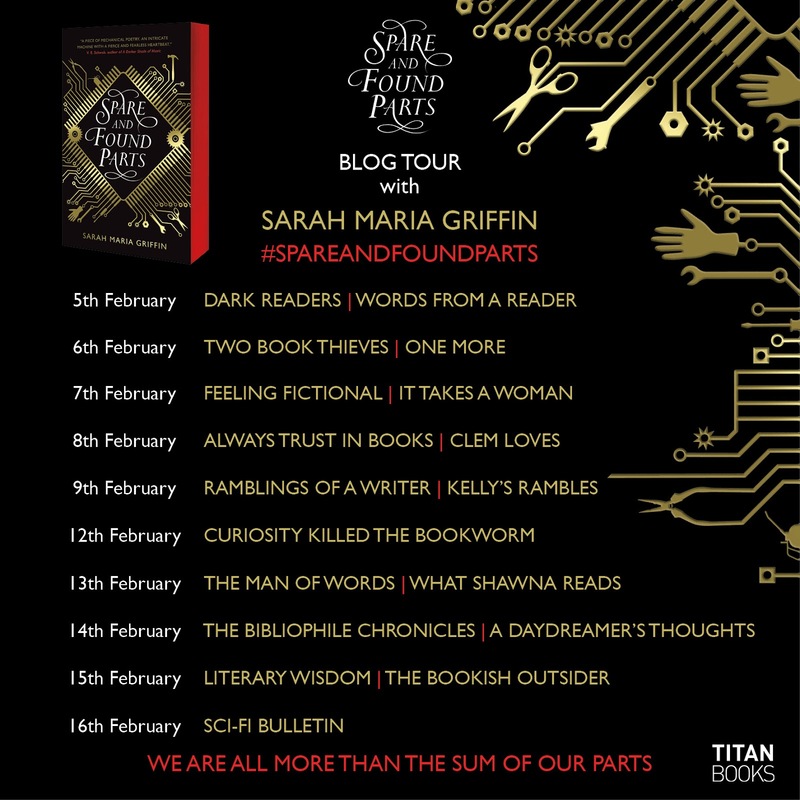 Certainly, I had spoken with friends about wanting to write some sort of warped, futuristic Frankenstein novel before - taken on a dare from Deirdre Sullivan, who is a very accomplished and brilliant artist - to make a monster of my own. But the flint that sparked the whole of the book was that single image, a piece of a broken mannequin in the water. So, that lands me in the slightly inconvenient position of writing my way out of that singular image and into a world, inhabited by people, and problems, and tension, and solution. But when I am just starting out, I move from picture to picture. What is the emotional texture of this image - how would I like a reader to feel when they read over it - who are the people in the picture, why are they there, what do they want most, what frightens them, who do they love? Pictures and questions feels like a deeply disorganized way to write a novel, and certainly, it is, but I’m not sure I could go straight beginning-middle-to-end without cracking up a little bit. Though, if I’m honest, the whole process of writing a novel is like cracking up a little bit - but in the best way, in a way I never thought possible, certainly not possible two and a half times over, which is where I’m at in my book-journey now. I write everything by hand, because to me, computers feel like work. Microsoft Word is a terrifying place, most especially when it is empty. A foolscap page and a fine point Sharpie, however, isn’t terrifying. It’s a playground. No matter where I’ve been in my life, bored and frustrated in school, anxious and stressed in college, the blank page has always been there for me. There’s nothing like the feeling of growing pages under your hand, or ink filling a page - or the freedom of scribbling something out, or a promise to yourself in the margins [I used to write on till roll I feel you!]. It feels more human to me than typing - which, unfortunately, is the next stage in things. I’m a swift enough transcriber, thankfully, and I find it is more focused work than the act of making-something-up straight into the white blank of the screen. By then, the book might be something that looks and feels like a novel - or an almost-novel. After that, my wonderful and patient editor takes me note by note until we’ve carved out all my mistakes, bad habits and accidental insistences on everyone smoking all the time - and importantly, make sure the plot looks like a plot, not just a series of pictures with questions hanging around them. I know this route is different for every writer, and I’m sure for me it will change with every book, but the feeling comes first with the building of the thing. That, I hope, is something I’ll be able to hold onto. The images just won’t quit. 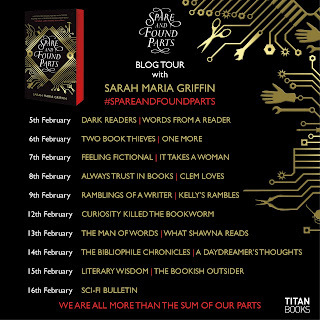 Check out the rest of the stops on the blog tour, pick up your copy and get involved! Synopsis: Nell Crane has always been an outsider. In a city devastated by an epidemic, where survivors are all missing parts—an arm, a leg, an eye—her father is the famed scientist who created the biomechanical limbs everyone now uses. But Nell is the only one whose mechanical piece is on the inside: her heart. Since the childhood operation, she has ticked. Like a clock, like a bomb. As her community rebuilds, everyone is expected to contribute to the society’s good . . . but how can Nell live up to her father’s revolutionary idea when she has none of her own? A lot of the time when we think of dystopian novels, they are dytopian dystopias ( i promise to stop using that word now), in the sense that they are full form exaggerated versions of themselves, built in world hundreds of years after the disaster. And I very rarely see them set in Dublin. 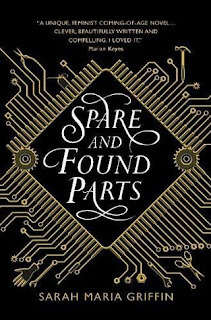 Spare and Found Parts flipped the genre on its head. It felt like the origins of a dystopian world, the aftermath where everyone is finding their place and trying to build their world again. I loved the connection to the past, it was inextricable linked to the present in as much as it was feared and revered. People understood it even used it in its various ways to help them rebuild a life whether it was their own and their added part or the way in which they tried to develop the community around them. What I will never understand is why the future is sooo afraid of paper and the power it holds. The pen is mightier than the sword eh. But as with anything we don't understand there is an underlying fear of the things we don't know, and the advancement it presents. They're stuck in a cycle that creates these great moments of conflict, especially when the technology starts talking. Having never been to the future and seen any negative effect of the rise of the robots I always side with the AI, or in this case IO. IO had this soft warm character that didn't seem restricted by his technology. He understood and that which he didn't he wanted to. He was a raw construction built out of spare parts, but more than that out of want and need and that was a really lovely journey for IO and Nell. This is where the comparisons of Frankenstein come in, i'm just not so sure Nell was a mad scientist in the way that lore has us see Victor. There was a beautiful scene with Nell, it was like a classic film moment, and when you get to it you'll feel the emotions too! Nell was a great character. As much as she was part of the world around her she was different in so many way and she ( and through her, I) felt these loud and clear. It's hard to exist in a place where it feels like the weight of the world is pushing down on you and this was very much the case for Nell who had to find her own path, which as we all know will never be smooth. It pits you against yourself and those around you and makes you human. It was at this point that the book shooook me, taking me to a point where I didn't expect it to go, amping up the drama and had be gripping the book. I was here for ever page of it. This is something that seems to happen a lot with me, I never see these twists and turns coming and I think that's the sign of a good story teller. The book had great pace flowing along beautifully unveiling its mystery's piece by piece. It gave you enough so that you built the world around you, you vibed with, and moved with the characters. I loved the setting, but I'm not sure I can see Dublin in the same way, so might have to avoid trips there for now. This was a fresh take on a genre. I'm excited to read more from Sarah and see what weird and wonderful journeys she can take me on. The Lighthouse is the most recent in dystopian bars. Maud Gonne Hospital is a Gothic mecca of extra body parts. Kathleen Ní Houlihan is a 600ft stone statue that at the same time watches over dissertation writing service and midgets the city's occupants. Hi, nice review overhere, Sarah. I was reading this book b4 and i like how you discribed author's message. You should try to write book reviews for this site, it might work for you. ok google langsung taekeunnya web anu uing hungkul ulah anu batur mah, awas siah google mun teu di taekeun anu uing. Thank for the blog, You can use book cover protector if you want to protect your book from getting destroyed.